From children's toys to winter coats, there are many applications for heavy-duty zippers. These simple closures are easy to install and affordable to purchase. Two-way zippers - These open at both ends, allowing you to unzip a garment, bag, or other item from the top or the bottom. Water-resistant zippers - These zippers are perfect for raincoats or waterproof bags, since they form a seal that lets only a minimal amount of moisture through the opening. Extra long zippers - These zippers are ideal for making sleeping bags or tents, and they come in lengths of 120 inches or more. Marine zippers - Designed to resist corrosion from salt air and water, these zippers are perfect for making boat seat covers and other outdoor projects. Self-mending zippers - These are perfect for tough applications that may cause damage to the zipper. Separating zippers - These zippers unzip all the way, making them perfect for coats and jackets. Zipper tape - This type of zipper has no defined end, giving you the ability to customize its length. If you need a zipper for a heavy-duty application, you can find several options in your local fabric store. Most fabric stores carry these zippers in a variety of lengths and colors. However, if you're looking for something very specific or need to get a good deal on several heavy zippers, shopping online may be the best choice. Seattle Fabrics sells tough zippers in many different styles. You'll find everything from sleeping bag zippers to heavy-duty pocket zippers. Beacon Fabrics specializes in outdoor fabrics and notions, including utility zippers. Custom Zips makes zippers to your specifications. You can buy a heavy duty model in the style and size you need for your project. ZipperStop sells heavy-duty closed-bottom and open-bottom zippers, as well as a variety of other sewing trims and notions for utility projects. 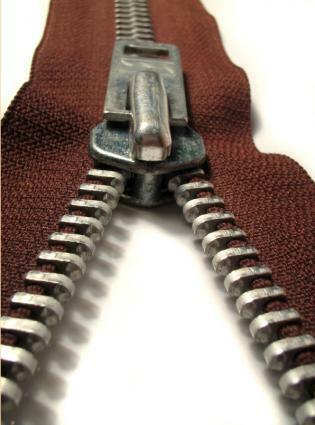 LenZip makes custom zippers for industrial applications, as well as zippers for use with leather, marine and automotive projects, tents and other uses. Adjust your sewing machine stitch length to be longer than normal. Sew a seam where you plan to place the zipper, and then press the seam open. Remove the zipper from its package, and take out any staples. Iron the tape on the sides of the zipper to make sure it's flat. Place the zipper upside down on top of the seam. The pull tab should be facing into the fabric, not up at you. Adjust the zipper so that it is straight and follows the seam. Use small pins to hold the zipper in place along the seam. Install a zipper foot on your sewing machine, and then sew along each side of the zipper with a normal stitch length. Connect the two sides by sewing along the bottom of the zipper opening. Use a seam ripper to open the seam that covers the zipper. Remove any loose threads. Using heavy-duty zippers allows you to create durable and useful items for a variety of applications. From handbags to automobile seat covers, you can create a simple closure on almost any project.